Times Square erupts with historicness. In the immortal 1975 words of Parliament, "They still call it the White House, but that's a temporary condition." Too, too much to round up this morning, but we'll leave you with a few highlights. > The NY Post may have been all crushy for McCain-Palin, but they were the first to hand Obama the win in what Gawker calls "a fast, scrappy call by a dead-trees publication." > Last night was a historic moment for… hologram technology! CNN showed off its desperate, distracting gimmick one last time, beaming "performer and Obama supporter" Will.i.am into its studios where he had an awkward conversation with Anderson Cooper. 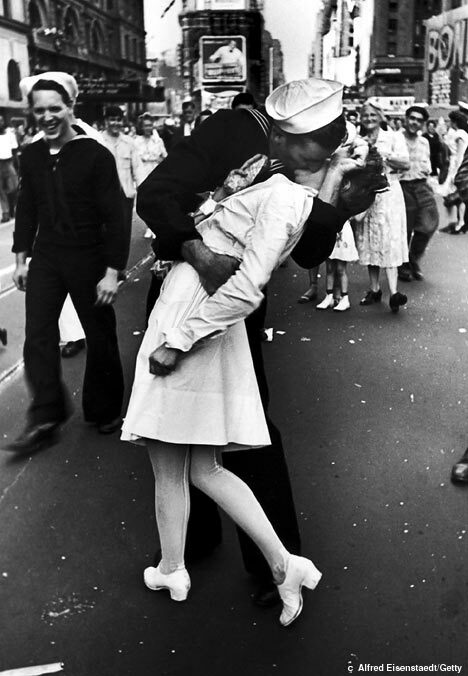 > Flickrer Sionfullana snaps what we're calling The New Kiss, a recreating of Alfred Eisenstaedt's iconic image of a Times Square lip lock amid celebrations at the end of WWII, originally published in Life magazine. If only CNN's hologram technology could bring back the dead for some talking-head commentary at moments like this. > Like a force-field that's temporarily disabled, Obama's victory literally causes Gawker to lose its ability to snark (for about five minutes) and call today "the redemption of a nation." One commenter notes there's "plenty of time to be cynical tomorrow." > Manhattan User's Guide sums it up nicely: Good morning, New York. > Gowanus Lounge (happily) admits they were wrong in saying "America is not New York and certainly not Park Slope and there was no way this Obama guy could win in November." And that they "cried like a baby." > And in other news, Park Slope finally gets an outpost of cult chainlet Atomic Wings on 9th Street, between 5th and 6th Avenues. Hope, change and wings! God bless America!